USAGE GUIDELINES: : Take 1 capsule, 2 to 4 times per day or as advised. Take 30 minutes before meals. Do not exceed the recommended daily intake. Food supplements should not be used as a substitute for a varied diet and healthy lifestyle. Consult your doctor before taking any food supplement or changing your diet. Garcinia Cambogia Complex is a combination food supplement and “carb blocker”, with a range of specialist weight management ingredients: Garcinia Cambogia powder, green coffee extract, kidney bean extract, glucomannan, cinnamon, Conjugated Linoleic Acid (CLA) and chromium picolinate. Garcinia Cambogia powder: A small fruit that resembles a miniature pumpkin. It is indigenous to India and parts of Asia. The active extract called Hydroxycitric acid (HCA) from its fruit and rind is popular in many natural weight loss products. 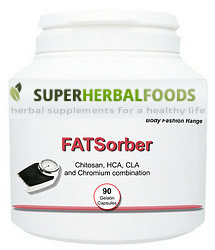 It is used to suppress appetite and enhance fat-burning. The theory behind garcinia cambogia is that HCA inhibits an enzyme called citrate lyase that helps turns excess carbohydrates into fat. By inhibiting this enzyme, the body boosts carbohydrate oxidation i.e. it burns up the extra carbohydrates. In some Human double-blind studies using garcinia cambogia or a placebo, the HCA group doubling or tripling weight loss results over a 12-week period as compared to the control group. Glucomannan: A sugar made from the root of the konjac plant, which has been used for centuries in traditional Japanese cooking as a thickener or gelling agent. It is so renowned in Japan that it is now widely referred to as “the broom of the intestines". Glucomannan acts to create a sense of fullness (without leaving you feeling gassy or bloated), by absorbing water and expanding to form a bulky fibre in the stomach. It can therefore assist with appetite control and the regulation of cravings. When consumed, glucomannan also “sponges” up water in the digestive tract, reducing the absorption of carbohydrates and cholesterol and thus supporting weight loss. Green coffee extract: Green coffee beans are beans that have not been roasted. The roasting process reduces amounts of the active chemical, chlorogenic acid. Therefore, green coffee extract (from unroasted beans that have been soaked and then concentrated) have a higher level of this acid compared to regular, roasted coffee beans. Chlorogenic acid in green coffee beans has been shown in studies to have potential health benefits for the heart, diabetes and weight loss. For high blood pressure, it can affect blood vessels so that pressure is reduced. For weight loss, chlorogenic acid is thought to affect how the body handles blood sugar and metabolism. Kidney bean extract: Kidney bean extract is a natural substance commonly sold in supplement form. Technically referred to as Phaselous vulgaris, it is typically referred to in weight loss circles as a “starch blocker”. It works by preventing alpha-amylase (an enzyme that occurs naturally in the body) from breaking down carbohydrates into glucose (sugar). By slowing down alpha-amylase activity, less glucose is present for the body to turn into fat. Kidney bean extract has also been associated with stable blood sugar levels, protecting against diabetes and heart disease, enhanced athletic performance and increased energy levels. Conjugated Linoleic Acid (CLA): A much researched fatty acid found in read meat and dairy products. It is a powerful antioxidant, immune system support and as a weight loss aid, helps muscle tissue to burn more fats, thus lowering body fat and cholesterol levels. It also raises Good cholesterol (HDL) levels and can lower elevated triglycerides. Additionally, CLA is a potent anti-cancer chemical and can help to dissipate certain cancer cells from the body. Has been known to help improve bone strength and increase muscle tissue. As a slimming aid, it helps the body regulate fat and protein metabolism. There have been numerous studies showing some spectacular health benefits and in particular can reduce the amount of bodyfat while increasing muscle mass. As muscle burns excess calories, more muscle equates to more calories burned and less body fat storage, especially around the abdomen area. Cinnamon: Cinnamon is widely recognised as a metabolism booster, which assists the body in the faster burning of calories and fat stores for use as energy. It also has a regulatory effect on blood sugar levels and simultaneously increases insulin levels in the body, helping to control both the appetite and cravings. Chromium Picolinate: is an essential trace mineral that plays an important role in our bodies' normal carbohydrate metabolism which converts foods we eat into sugars. Chromium aids insulin, a natural hormone that's released in response to eating carbohydrates, in properly "transporting" these sugars into cells to be stored as energy. It also supports stable blood sugar levels - crucial for slimmers as low & high spikes can lead to cravings, excessive hunger and binge eating.